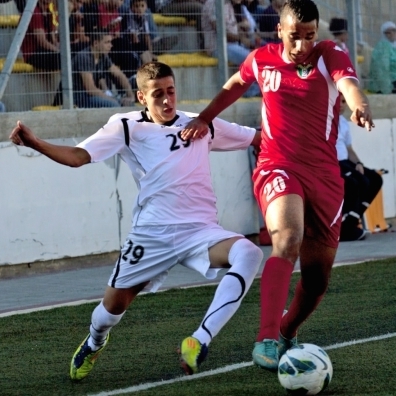 Browse: Home / Does The IDF Target Palestinian Soccer Players? Ma’an, the Palestinian news outlet, reported the shootings of Jawhar Nasser Jawhar, 19, and Adam Abd al-Raouf Halabiya, 17. 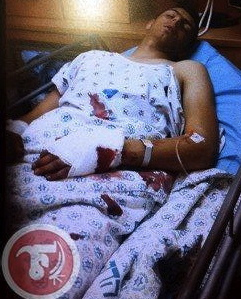 Palestinian footballer Jawhar Nasser Jawhar, 19, in his hospital bed, following his attack by Israeli forces,Jan.31, 2014. That obvious pro-Israel and clearly racist distrust of all matters pertaining to Palestinians, was quickly underscored by that same questioner when he sent a subsequent email to Zirin, saying, never mind, I have found a report of the shootings in Ha’aretz, a Jewish news outlet based in Jerusalem. Some critics reacted to this theory by saying the targeting charge was “laughable,” and “ridiculous,” One writer even wrote he would “reach out to The Nation directly to agitate for dismissal”. Yes it is certainly true that I don’t have a document signed by Benjamin Netanyahu calling for a systematic attack on the Palestinian national team. What I do have are names: real people, with real families, whose lives and deaths are testament to a story that needs to be told. There was Ayman Alkurd. He was a 34-year-old member of the Palestinian national soccer team. Alkurd was killed during the 2009 Operation Cast Lead when a missile was sent into his home in Gaza. There was Wajeh Moshtahe, another national team member. He was killed in his home during Operation Cast Lead as well. He was only 24. There was Shadi Sbakhe, another national team member who suffered the same fate. All three, in fact, died within seventy-two hours of one another. They reminded many, at the time of their deaths, of Tariq Al Quto, described by the BBC as “a talented midfielder,” who was killed by the IDF in 2004. Then there are the imprisoned. We can start with Omar Abu Rios, the former starting goalkeeper for the national team. He was arrested at age 23 for allegedly being part of an attack on Israeli troops at the Amari Palestinian refugee camp near Ramallah. There was also Muhammad Nimr, a top 23-year-old striker and national team member, who had his house destroyed by the IDF and was then jailed without charges being filed. Nimr’s story echoed that of another striker, Zakaria Issa, who had been jailed for sixteen years before being released in 2013 when he was struck with terminal cancer. Then there was Mahmoud Sarsak. Sarsak was a defender on the national team who was arrested and jailed without charges while trying to cross a checkpoint in order to join his teammates. His plight became an international cause when the Palestinian national team member went on a three-month hunger strike while being held in an Israeli prison. This is reality for the Palestinian national team: four dead by Israeli munitions and—at least—three jailed in Israeli prisons without trial over the last decade. I have no idea whether people will see this as constituting a “targeting” of the Palestinian soccer players. I do believe that it is our job as sports journalists to ask the questions. Zirin is not optimistic that the notoriously conservative FIFA will act to investigate the charge of targeted killings by Israel. But what is clear is that Israel has a well-documented record of targeting Palestinians it wishes to remove from action of any kind. The 2014 FIFA (The Fédération Internationale de Football Association) is the international governing body of association football, futsal and beach soccer. This summer’s World Cup will run from June 12 to July 13. The Palestine team did not qualify for this year’s Cup. Because FIFA wants to “grow” soccer in all regions of the world, in December 2010, Russia and Qatar were chosen to host the 2018 and 2022 FIFA World Cups, respectively. FIFA plans ahead, given the complicated logistics involved in holding World Cup Events. Will FIFA dare look ahead to its next World Cup events in Russia and Qatar, without having first confronted the problem of the FIFA membership of Israel, a FIFA member which now stands accused of using attack dogs and deliberately targeting Palestinian soccer players?